In a video that’s making the social media rounds, a young Thai man is caught sucker punching a 72-year old Aussie man when he isn’t looking in what seems like a road rage incident. The video you’ve probably seen is only part of a much larger dramatic story. On this video from LiveLeak, you can see what happened prior to the local police arriving the infamous punch that bloodied and knocked unconscious the elderly “pensioner”. 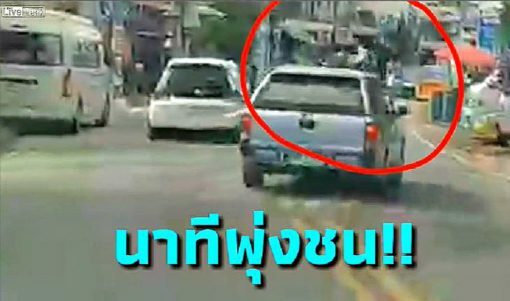 A dashcam video shared by Pattaya Eastern News shows the expat, identified as Gerard Collins, retrieving what appears to be a machete from the back of his car and running over to confront Sumet Roongrattanapan, 28, after their cars collided. In the above video clip caught by another motorist’s dashcam, that helpless, harmless elderly Aussie proved that not all was as it seems. The Aussie wasn’t the victim, but was clearly the antagonist. In what looks like maybe at worst a fender bender, or just road rage, you can see the 72-year old man jump out of his car, open up his hatch and pull out what has been reported as a machete. He looks to go to the passenger side of the car in front of him and because the view is blocked, we can’t see what he does. What we do know is that the Thai man accused him of breaking at least one of his windows, shattering his windshield, and slicing his arm! Still, the craziness doesn’t stop there. What’s worse is that when the Aussie man is finished raging, he jumps out of his car, races away and bowls into the someone in the street (we’re assuming it’s the Thai man that punches him later). We can’t see exactly what happened, but the man is hit by the car, hits the windshield and rolls over the front hood of the car. Luckily, the motorist with the dashcam followed him, setting up the video that probably brought you to this post. Here’s what happened next after Roongrattanapan caught up to Collins. So it wasn’t just a “normal” case of road rage and a man turning the level up to 10, but it was also a hit and run, knife attack, street fight and karma all rolled up into one crazy scene. 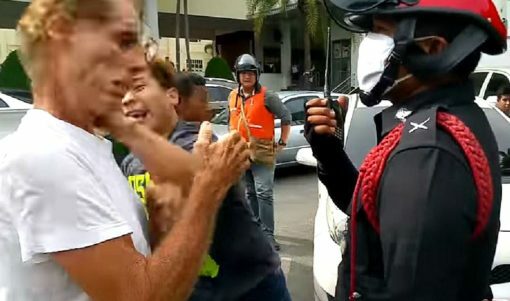 After the man was knocked out by the punch, a Thai woman screamed out “He deserved it!” and we can’t say we disagree. What would you have done had someone rear-ended your car, flipped you off, brought out a machete-sized knife from their trunk, slashed you with it, smashed your car windows, ran you over with their car while fleeing the scene and then blamed you for everything. Don’t answer because you wouldn’t know until all that crazy hit you all at once. Do we condone the sucker punch? Sitting in front of our computers, probably not. That’s the point, it’s easy to be judge in jury when none of that happened to you. 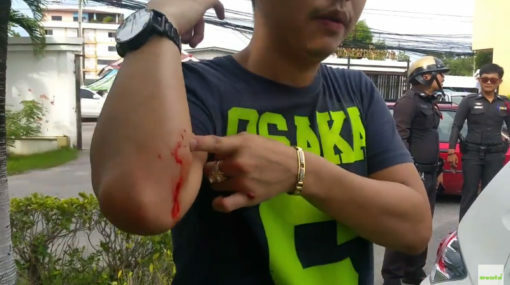 Roongrattanapan was rightfully angry considering that he just had his car damaged, attacked by a machete, then hit by Collins’ car and run over as the assailant tried to get away. Roongrattanapan could have easily died thrice in that 40 second exchange. We think he kept his cool for longer than most. Sumet yelled out “I have clip! I have clip! You wanna kill me!” as he showed a video from his phone to the police. I’m sure his anger grew as he replayed the video with the culprit standing right in front of him, not looking at him and attempting to explain away his 100% indefensible behavior.